Men Singing is the long-awaited follow-up to the band’s 2001 self-titled debut. The 2013 line-up of the band includes new collaborators Jarrod Gosling (I Monster/Regal Worm), Phil Manzanera (Roxy Music) and classical violinist Steve Bingham and drummer Andrew Booker (both part of the current live no-man line-up). The debut Henry Fool album was a mixture of instrumentals and songs, whereas Men Singing is a solely instrumental album, and is a much more coherent listening experience. Men Singing was recorded over a long period of time – between 2006 and 2012, with Jarrod Gosling and Phil Manzanera adding their contributions towards the end of the recording process. Phil Manzanera adds guitar to Everyone In Sweden and Man Singing. Jarrod Gosling appears on all four tracks, contributing Mellotron, glockenspiel and the excellent album artwork. Album opener Everyone In Sweden sets the mood, with shifting time signatures, and solos alternating between guitar, jazzy saxophone, and very distorted bass. The music shifts across genres, often two or three times in the same song, which is a great way to keep you listening, especially in the longer pieces. Some instrumental albums can be hard to listen to in one sitting, but Men Singing is certainly not background music, and the performances demand your full attention. The vintage keyboards often give a real early to mid-70s feel to the pieces. There’s a wonderful section 7 minutes in to Everyone In Sweden, the album’s longest track, where everything breaks down, and keyboard washes give way to a mournful sax and guitar line as the piece ends. Man Singing, which of course has (no) man singing, is a slower paced affair, and features no-man’s Tim Bowness on very angular chord/arpeggio guitar. There are hints of Adrian Belewesque guitar sounds on the album, which along with the keyboards, sometimes give a feel of Bowie‘s Berlin trilogy as well as more obvious King Crimson influences. The cut to the basics chorused guitar and strings ending works perfectly on this track. Track 3 is the perfectly titled My Favourite Zombie Dream, which has a real feeling of dread and anticipation about it. Oscillating strings from Stephen Bennett underpin the piece, as it slowly builds to it’s climax, like a soundtrack to a yet-to-be released George A. Romero film. The final track on Men Singing is the 13 minute plus Chic Hippo. The violin playing of Steve Bingham features heavily, and Stephen Bennett (according to the sleevenotes) is credited with Miles Davis, Mavis Riley and Terry Riley impressions. Mavis Riley? That must have been difficult to pull off – “ooh, I don’t really know”. Apologies, no-one under 45 (or anyone outside of the UK) will get that cultural reference. The mid-section of Chic Hippo is one of the most rewarding parts of the album. Fluttering church organ sounds give way to sax riffs from Myke Clifford that would not have sounded out of place on early Bowie or Roxy Music albums, topped off with some wonderful slide guitar from Michael Bearpark. The percussion work from Andrew Booker is another highlight of Chic Hippo. Men Singing is a strong second album from Henry Fool, and a radical departure for Tim Bowness. Have a listen to the edits on this page, via SoundCloud and YouTube. Another indication of the quality of this album is that it was mastered by award-winning Pink Floyd sound engineer, Andy Jackson. The album is likely to appeal to fans of mid-period Porcupine Tree as well as those intrigued by Steven Wilson‘s recent foray into more improvisational / jazz-rock influenced material. If you like albums that disturb as much as entertain, then let the men of Henry Fool sing for you. Love and Endings is a recording of no-man‘s concert at the Leamington Spa Assembly in October 2011, as part of the record label Burning Shed’s 10th anniversary celebrations. For the those not yet familiar with no-man, they are a British band comprising Tim Bowness and Steven Wilson (Porcupine Tree). Formed in 1987, no-man have produced a fine back-catalogue of work, and boast guest appearances from the likes of King Crimson‘s Robert Fripp and Pat Mastelotto, Porcupine Tree’s Colin Edwin, Richard Barbieri and Gavin Harrison, jazz musicians Theo Travis and Ian Carr, electronic artists Scanner and Faultline, Bruce Kaphan (American Music Club) and Dave Stewart (Egg/Hatfield & The North). Former members of 80s band Japan – Steve Jansen, Richard Barbieri & Mick Karn, toured and recorded with the band in the early 1990s. Since the early 1990s, the band have existed mainly as a studio outfit, rarely venturing into the live arena, so no-man live shows are hugely anticipated events. As well as capturing one of the finest no-man live performances, Love and Endings is also a perfect introduction to the band’s music for the uninitiated. For people already familiar with the band’s music, Love and Endings may come as a surprise, as the live incarnation of the band is a powerful beast. Recent studio releases from no-man have included twisted, dark electronica (the Wild Opera album), fragile, semi-acoustic / minimalist songs with stark lyrics (Together We’re Stranger) through to their most organic release in 2008’s Schoolyard Ghosts. Recent no-man live appearances, though few and far between, hint at a new direction, and one that will appeal to fans of Steven Wilson’s work in Porcupine Tree. Opening track my revenge on seattle is very electronic, awash with percussive synths in it’s studio incarnation, but the Love and Endings live version is stripped back, with deep chorused bass, textured guitar and mournful violin. The joyous middle section showcases some wonderful interplay between the musicians and powerful tom / cymbal work from drummer Andrew Booker. time travel in texas is another song from the mid-90’s Wild Opera album, with the 2011 live version losing it’s scratchy Portishead trip-hop atmosphere, mutating into a brooding, twin-guitar heavy assault. all the blue changes is a more percussive take on the track that originally appeared on 2003’s Together We’re Stranger album. One of the highlights of the live set, with my favourite Bowness vocal on the album and some fine layered keyboards from Stephen Bennett. The song shifts up a couple of gears with some brutal Wilson guitar and pounding Booker drums around 3/4 of the way through, sounding like Sigur Rós on steroids or the wall of noise of Mono, I swear you can hear the audience gasp before applauding at the end! The formerly sample-driven pretty genius is reinvented as a much looser song on love and endings, but remains true to the spirit of the original version, with some beautiful violin work by Steve Bingham, and a great sloping back-beat from Messrs Morgan and Booker. lighthouse is my favourite no-man song, and the love and endings live version does not disappoint. It’s no-man’s most progressive sounding track, and although originally written in the early 1990s, has not aged at all. I’ve said it before, and I’ll say it again, the section of the song from 4:08 onwards is one of my favourite pieces of music of all time. It never fails to move me. Have a listen to the Love and Endings version of lighthouse, taken from the official no-man SoundCloud, below. beaten by love is a previously unreleased no-man track, written in 1987 and performed for the first time at this show. The track displays hints of some of the darker This Mortal Coil tracks mixed with a healthy dose of Siouxsie & the Banshees, and is unlike any recent no-man material. Following the darkest track on the album with one of the most uplifting no-man songs, wherever there is light, works well, and shows the range in singer Tim Bowness’s vocals (from beaten by love‘s growl to the soft, breathy croon on this emotive and deeply personal song). she loves the city sounds. The live version of mixtaped is a lot looser than the Schoolyard Ghosts studio take, with some inventive percussive touches, and a wonderful mixture of textures and distorted, heavy guitar from Wilson and Bearpark, and works well as a set closer. The final track on the album was the encore on the evening, things change. The highlight of the live version of this track has always been the electric violin solo that is an integral part of the powerful outro. The version on Love and Endings is very different from previous live outings, watch the filmed version on the accompanying DVD to appreciate the performance fully. Love and Endings also comes with a DVD of the whole performance. The Love and Endings DVD is a very different concert film to the previous live no-man DVD, 2009’s mixtaped, which was a multi-camera shoot. The HD footage shot by Dion Johnson (of Signify films) captures the performance and the mood of the show perfectly on just two cameras. It was filmed from the front-row of the audience, so you get a real feeling of being in the crowd, and this gives a different perspective to most live films. The mixtaped DVD does offer a better variety of shots, and more close-ups of individual band members, features a full-length concert and an excellent no-man documentary, so perhaps should not be compared to the DVD that comes with Love and Endings. The Love and Endings film, although it has a few awkward zooms and camera angles that might not normally be kept in an official release, does capture a band performance that was better than the one on the previous DVD, and so is definitely a worthwhile addition to the no-man discography. The concert was not filmed with a DVD release in mind but the footage came out better than was expected, and the ‘guerilla style’ does give the recording its own, unique identity and captures the performance perfectly, and so offers good value for money as an added extra. The extra content on the DVD is a photo gallery – with an instrumental version of the live version of mixtaped as background music. Watch the promotional video for the album / DVD below. 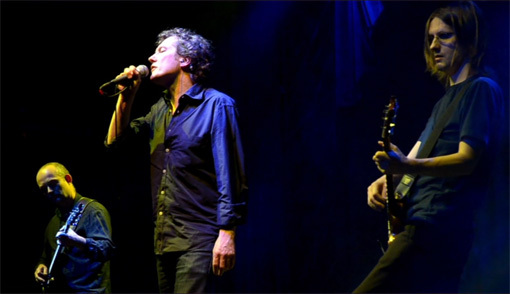 Love and Endings sees no-man’s core duo of Tim Bowness (vocals) and Steven Wilson (guitar) joined by classical violinist Steve Bingham and regular collaborators Michael Bearpark (guitar), Andrew Booker (drums & backing vocals), Stephen Bennett (keyboards) and Pete Morgan (bass). The Love and Endings CD / DVD is available from The Burning Shed. For more information on no-man, visit the no-man website, like no-man on Facebook and follow no-man on Twitter. The pictures of Tim Bowness & Steven Wilson courtesy of Charlotte Kinson.